An optimization design method is presented to reduce the undesirable vibrations caused by clearance for planar linkage mechanism. A clearance joint is defined and considered a contact/impact force constraint. Contact and impact force models for the clearance joint are established using a normal contact force model based on Hertz model with energy loss and a tangential friction model based on modified Coulomb model with dynamic friction coefficient, respectively. 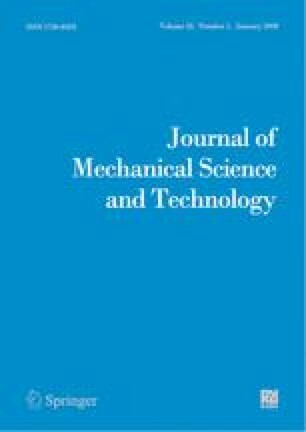 In view of the clearance joint, dynamic equations and optimization method for a planar four-bar mechanism are then presented as an application example. The optimization aims to minimize the maximum absolute acceleration peaks of the mechanism by determining the link lengths of the planar linkage mechanism. Finally, the optimization design is solved by a generalized reduced gradient algorithm. Results show evident decrease in vibration peaks of the mechanism and obvious reduction in the contact forces in the clearance joint, which contribute to a good performance of planar linkage mechanism systems. Zheng Feng Bai received his Ph.D. in Astronautics and Aerospace Science and Technology from Harbin Institute of Technology, Harbin, China in 2011. He is currently an Associate Professor in Harbin Institute of Technology, Weihai. His research interests include multibody system dynamics, and structural dynamics and its applications in aerospace and mechanical engineering.